Where do you BUY THIS scrapbook paper?! Here I spill my secrets. They’re actually really easy to find! First a caveat: many of my papers were bought 6-10 years ago. So papers you see in my DIY projects are likely not available now. But I can share the sources of favorite papers so you can buy similar ones. My style is all about patterns with global style, especially papers with an “olde world” look and layers of colors and patterns. If there’s script or world maps on the paper, I swoon! 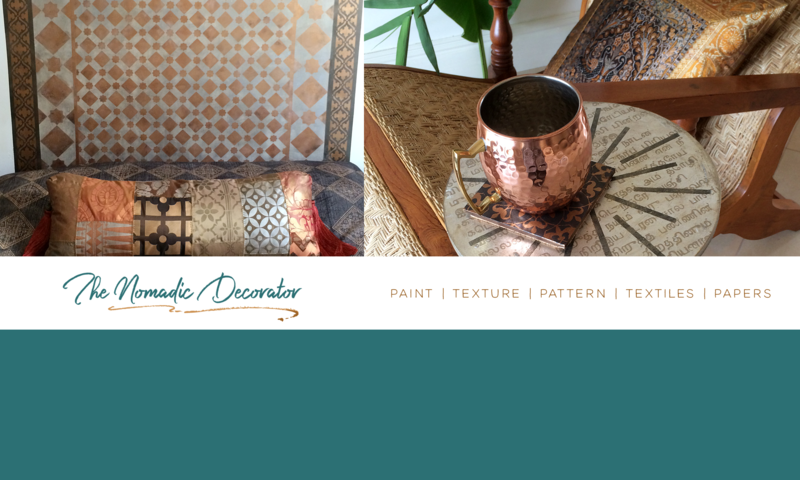 Do you notice the patterns behind the words Nomadic Decorator in the blog header above? Yep – that’s scrapbook paper! Paper Source — all about scrapbook papers! You can buy papers as individual pieces. You are more likely to find individual pieces in bricks n’ mortar craft stores. Online, paper is often sold in packs of many coordinated papers, because it’s more economical to sell that way. The pads of coordinated papers are a great value. They go on sale a lot, or you can use coupons for 30%, 40% and even 50% off. Some of these paper pads have a lot of papers, like 54 double-sided papers. Scrapbook papers can make any project look professional so easily. They make projects look expensive, when you really spent only a few dollars on the papers. In the next post in this series, I share where to find digital scrapbook paper online. Disclosure: This post contains affiliate links, which means I receive a small percentage of compensation at no cost to you if you purchase after clicking the link. I post affiliate links when I’ve purchased from the company myself or used the product myself, and can confidently share the company or product. This helps offset the cost of running this blog for you! Thank you for opening my eyes to alternate uses for scrapbook paper???????? You are welcome Rhonda! I hope you try some different things with scrapbook papers!